Location: East side of Ffordd Tanrhiw in Tregarth village. Present state: Demolished with a short section of platform at west end extant. 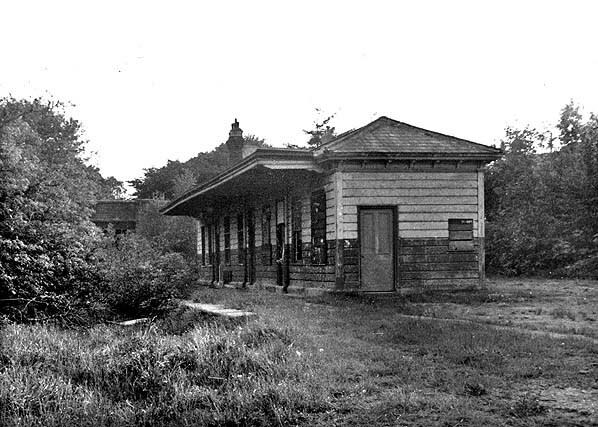 Notes: Tregarth station was situated on the London & North Western Railway (LNWR) Bethesda branch. The single-track branch was a 4-mile 26-chain line that linked the village of Bethesda to the Chester and Holyhead main line 52ch east of Bangor at Bethesda Junction. Between Bethesda Junction and Bethesda the line climbed by over 300ft which meant that there were steep gradients. The branch was authorised in 1880, engineered by Edward Walter Nealor Wood, C.E., and opened to passengers on 1 July 1884. Goods services were introduced on 1 September 1885. The branch closely followed the route of the Penrhyn Railway, a narrow gauge line that linked quarries in the Bethesda area to the coast. The Penrhyn Railway was owned by Lord Penrhyn and dated back to 1800. Originally horse-worked, steam operation was introduced in1877/8. The Bethesda branch crossed the Penryhn Railway three times (once under and twice over) and was built primarily to move slate from the quarries in the area. 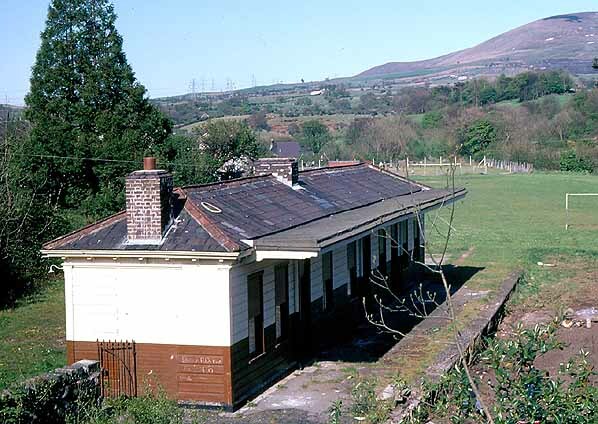 Originally Tregarth was provided with a signal box but it was an early closure being replaced by an eight lever ground frame at an unknown date. From the start passenger services ran between Bethesda and Bangor. The December 1895 timetable showed five up and five down trains from Tregarth on Monday-to Saturday. Originally standard trains operated with locomotives and coaches. The locomotive was able to run around its train at Bethesda and at Bangor. In 1906 the LNWR introduced a single-coach rail-motor to the service. It operated for a few years but was replaced in 1910 with two-coach push-and-pull trains that used 0-4-2 tank locomotives fitted to operate in push-pull mode. The locomotives were coupled to two coaches, the coach further from the locomotive having a cab so the driver could control the train from that end via a pulley and bell system. When the driver was in the coach end of the train the fireman operated the locomotive alone. On the Bethesda branch the push-and-pull sets were arranged so that the locomotive was at the Bethesda end of the train. It pulled the train up to Bethesda and pushed it down to Bangor - although due to the gradients it would have had to do very little pushing. By July 1922 the service operated by the push-and-pull trains had improved, there being eight departures and eight arrivals on Monday-to-Friday as shown in the table below. On 1 January 1923 Tregarth became part of the London Midland & Scottish Railway (LMS). The LMS summer timetable for 1932 showed Tregarth as having sixteen arrivals and departures on Monday-to- Friday with nineteen on Saturdays. There were even nine trains on Sundays. A good service continued to run throughout the 1930s despite competition from local buses. Being centrally located Tregath was popular with local residents and was well used. Some trains even continued on from Bangor to Menai Bridge and beyond. During the Second World War the Bethesda service was cut back dramatically, and when the war ended it was not restored to its former frequency. The Bethesda branch became part of British Railways (London Midland Region) on 1 January 1948. The summer timetable for 1948 showed eight Departures and eight Arrivals Mondays-to-Fridays as shown in the table below. Although Tregarth remained popular with locals the same was not true with the other stations because of the poor service and strong competition from local buses and by 1950 the Bethesda branch had become unprofitable. Typically by this time the trains on the branch consisted of only one coach. British Railways proposed withdrawal of passenger services in 1951, but despite strong local opposition the last train ran on 1 December 1951. The train was worked by 0-6-2T locomotive number 58903. It was driven by Huge Caulfield and fired by Eric Lynn. 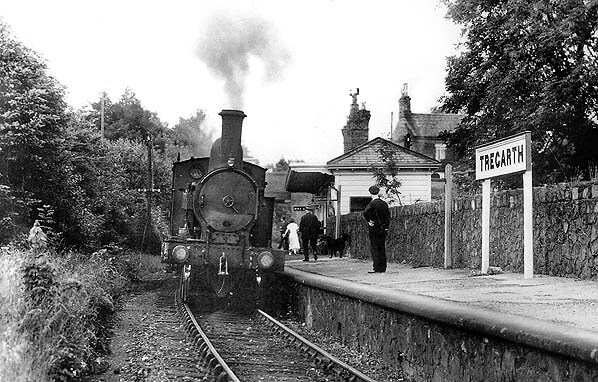 Tregarth and the other stations on the line formally closed to passengers on 3 December 1951.
train ever to travel along the branch. After it had departed the line was formally closed, and track-lifting by road vehicles began the following day. The station building remained in good condition until the late 1980s. A short section of platform survived the demolition of the station and could still be seen in 2013. 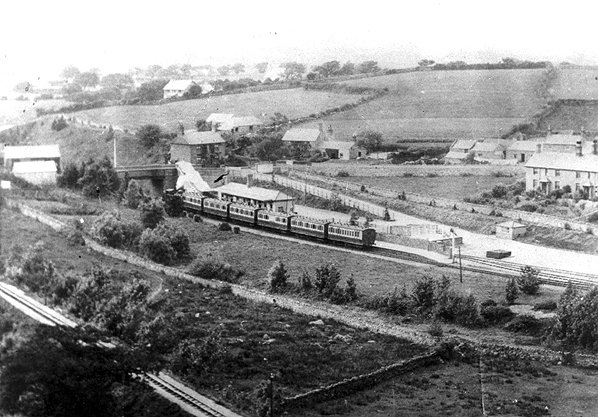 Looking north-west at Tregarth station from an elevated position in the first decade of the twentieth century. A train for Bangor is seen departing from the station. In the bottom left corner of the photograph the Penrhyn Railway can be seen. Tregarth station shown on a 1914 map. Looking towards Bangor from the track bed at Tregarth in 1949. A London and North Western radial tank loco stands at the platform with a passenger train for Bethesda. Looking towards Bethesda from the Ffordd Tanrhiw road bridge in 1949, less than two years before the station closed to passenger traffic. 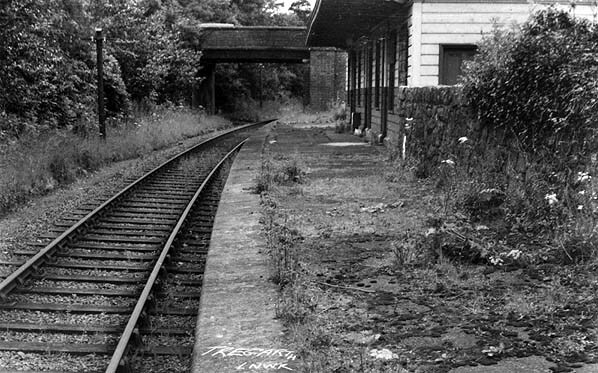 A view from the platform at Tregarth looking in the Bangor direction in the early 1960s, not long before final closure of the line. Although the station building is still intact, some of the windows are boarded up, and vegetation is starting to take over the platform. The same view as the picture above, around ten years later in April 1973. The station building remains unchanged, but evidence of excavation can be seen in the foreground. 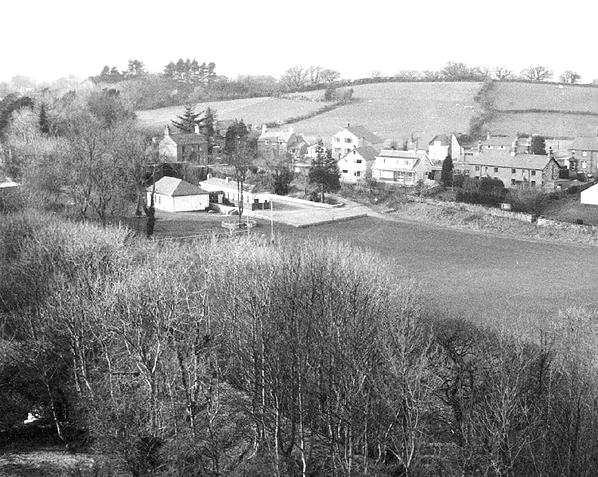 A view of Tregarth from the Ffordd Tanrhiw road bridge looking in the Bethesda direction in 1973. The trackbed west of the station building, together with the goods yard, has been levelled off and made into a recreation field. 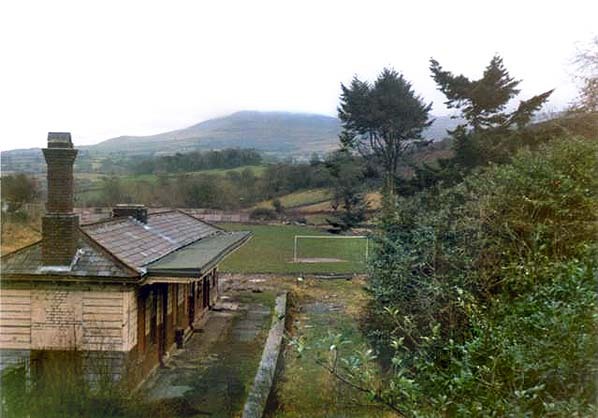 Tregarth station on 2 May 1981. 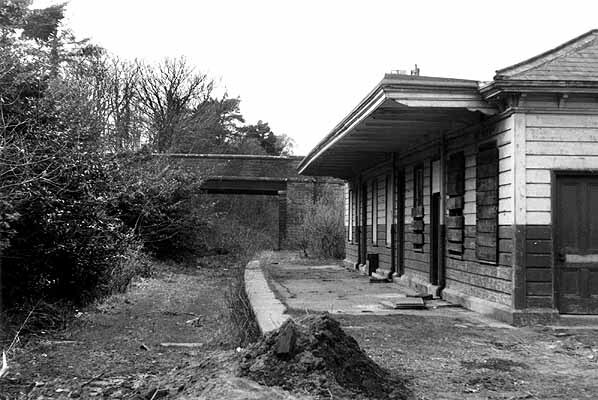 By 1977 the station building still remains fairly intact, but vegetation has now taken over the remaining track bed, and is starting to grow over the platform. 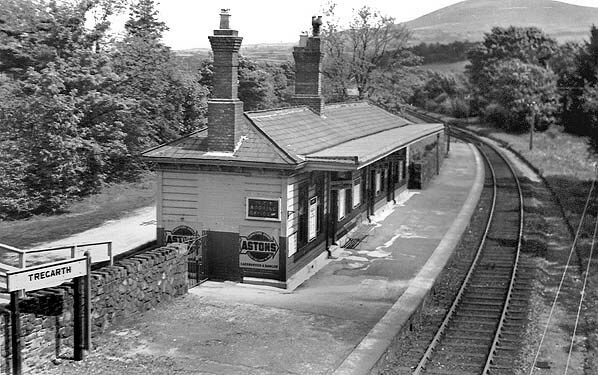 Tregarth station looking north-west in 1987, from the same viewpoint as the 1910 view (above). The station building is still present at this time. Also of interest is the Penrhyn Railway trackbed which can be seen at the bottom of the photograph. Looking in the Bethesda direction from the platform edge on 31 January 2013. All that remains of the station is the section of platform. The trackbed survives from the road bridge to a children’s nursery, which now occupies the west end of the site. A similar view to the picture above, but taken from the road bridge, on 31 January 2013. The recreation field and car park behind the nursery have obliterated not only the goods yard but also any remains of the immediate track bed to the west of the site.